Burbank, CA – This weekend, October 11, the Martial Arts History Museum launches the first of many new animatronic creations for the public to enjoy. 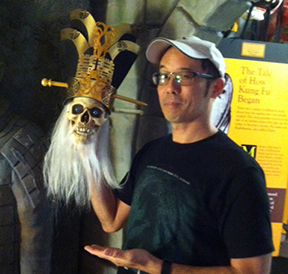 As the skull and crossbones head greets audiences with the famous “dead men tell no tales” on the Pirates of the Caribbean ride at Disneyland, the Museum adds Master Lo Pan from the film “Big Trouble in Little China” to greet its visitors. Lo Pan was designed by the creative minds of three main individuals; Paul Wee, an Emmy Award Winning artist of The Simpsons fame; Bill Webber, a Halloween designer and animatronic wizard and Michael Matsuda, a former Disney artist and president of the Museum. This is the first of many new animatronics items in the museum. Plans are to have the tikis chant and talk to the audience to greet them in the Hawaiian section. Another goal is to have two animatronic heads arguing with each other in the Pavilion area to entertain the guests before each event. Animatronics is not new, it's been around since the opening of Disneyland, but even though it has evolved and become more sophisticated and lifelike, it is still that sense of imagination and mystery that makes it fun and enjoyable. In order to compete with the kids who are focused on phone games, social media and more, new, creative venues are a must. “It's not enough, we must evolve in providing a new platform for learning. We will never catch up to the iphone, but we can provide just enough creativity to make a difference,” says Matsuda. The Martial Arts History Museum is the first museum of its kind in the world and is located in the city of Burbank. “I cannot stress the importance of giving back to the community. One out of every five people have taken martial arts sometime in their life. Filmmakers even do movies giving tribute to the old martial arts movies such as Kill Bill, The Last Samurai and many more. Let's really give back to the arts by making a generous donation to the Museum. When we are all gone, it will be the museum that will keep our history alive,” concludes Matsuda. The museum is a non-profit 501(c)(3) organization and it is open for donations. The museum is located at 2319 W. Magnolia Blvd., Burbank, CA 91506. Website is Mamuseum.com or call (818) 478-1722.